Grand Boulevard and other Downtown bike lanes won’t be coming in 2017, and the problems they face could jeopardize other planned bike lanes around the city. In June of this year, the beleaguered Grand bike lane project was dealt another setback in its long struggle toward implementation. The Federal Highway Administration nixed the City’s latest plan to bundle the paint-only bike lanes with a heavy roadway construction project. An effort to satisfy a complicated rule dictating the types of contractors that local governments must hire to build federally funded projects resulted in extremely costly bids – a complication that comes at a $300,000 premium. As a refresher, the City of KCMO was awarded this federal funding in 2013 to paint a two-mile bike lane on the downtown boulevard as well as a few additional miles of lanes on 18th, Beardsley, 3rd, and West Pennway. The project, dubbed the Downtown Neighborhood Loop Connector, would be the City’s first attempt to build a connected network of bikeways. The bike lane on Grand would be an incremental step toward “Making Grand Grand,” an ambitious KCMO Parks plan to transform the street into a European-style boulevard. Unfortunately, the paint-only project has been plagued by administrative red tape, poor execution, and a general lack of leadership. A project that was intended to be a quick-build, incremental step toward the implementation of a bigger vision is now years behind schedule with no light at the end of the tunnel. It is time for KCMO leaders to step up and demand a resolution. It has taken four years to figure out how to unlock the federal funding to paint some stripes. We continue to maintain that this should have been in-sourced and built with local funds a long time ago as has been done in other cities. It’s also time for KCMO to scrap the outdated project design. The state of the practice has changed over the last four years and the time for iterative design has long since passed. Let’s get serious about building low-stress bikeway networks and build a protected bike path on Grand. 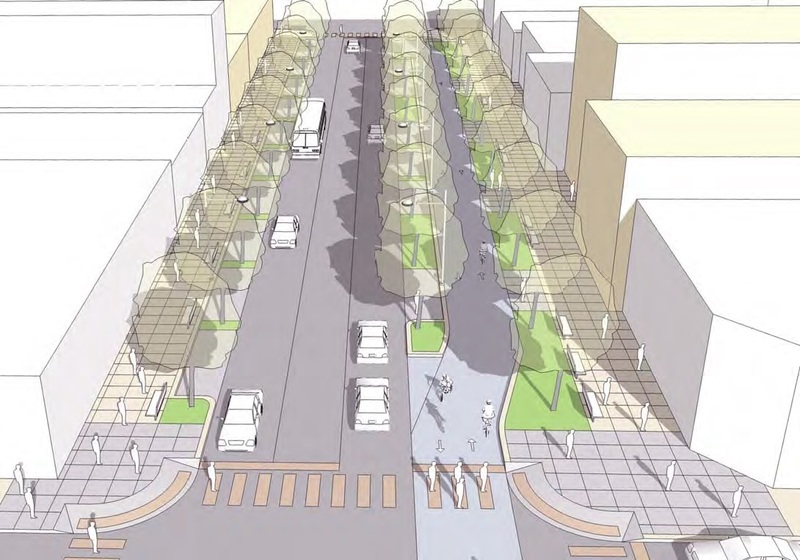 “Making Grand Grand” proposed a 2-way protected bike lane for Grand. Paint the lanes now as a parking protected bike lane. Just do it. The City hires contractors to paint roadway striping all the time; there is no reason why they can’t do it for this purpose. Use the in-house design talent to quickly turn around a new design. Pull funding together to implement the Armour and Benton Blvd. bikeways this year as well. The city promised delivery of these projects this spring, including a public open house at MainCor to showcase the project at the neighborhoods’ request. They received Federal funding for this project was received in 2010, and the design work is complete and has been vetted by the public. It’s time to put them on the ground. A “bus bulb” along a protected bikeway in Austin, TX. Next, attain permission from MoDOT to use the federal grants to build concrete “bus bulbs” to support KCATA’s realignment of many of its bus routes onto Grand. Add a few protected intersections for good measure. This is how iterative design can and does work – build something quickly and then improve upon it in phases. And, make no mistake, this is not just a story about a downtown bike lane. The failure to deliver on Grand is a symptom of a much larger problem that will prevent any meaningful development of a citywide bikeway network. The city is investing a lot of time into a complete bike plan overhaul right now – an investment that will go to waste unless this culture pattern changes. Federal funds are not a good fit for painting bike lanes. The City should be investing local funds into these projects. Without a dedicated funding source for implementation, the new BikeKC plan will join the plans for Grand, Armour, Paseo, 18th, Lexington bikeways: sitting on a shelf collecting dust on the 20th floor of City Hall. I want to help? What can I do? Stay tuned to this blog to learn how you can get involved and help move the City forward. Posted in Advocacy, News and tagged advocacy, Downtown Bike Network, GOBondKC, GrandBoulevard, kcmo, KCMO GO Bond, KCMO-Central.